Normally, we call them Raggedy Robins. 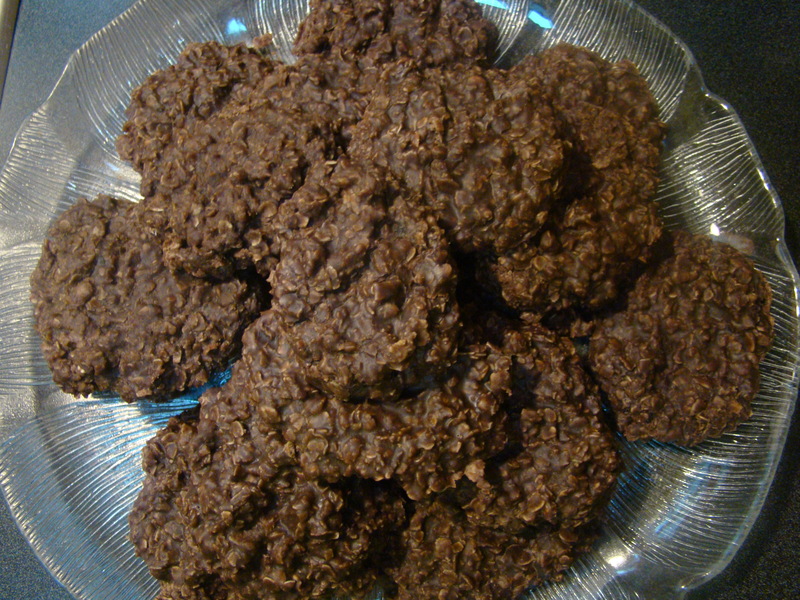 (I’ not sure why we call them that, but they are traditional chocolate, peanut butter, oat filled no-bake cookies.) 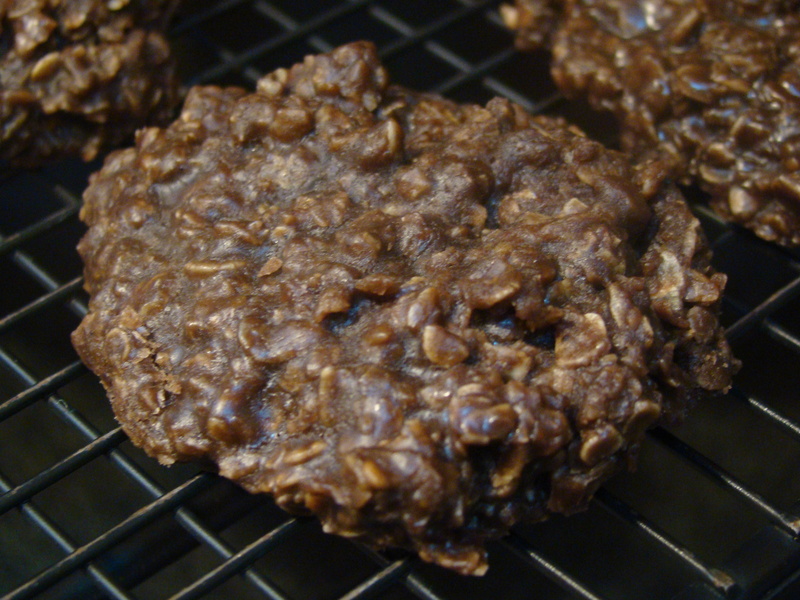 Today, I think we should call them Hurricane Cookies! It just sounds so much more exciting, don’t you think?? Since I live on the east coast, and pretty much directly in the path of Hurricane Sandy; I wanted to make a few quick snacks that I could finish if the power went out. Seriously……..6 kids with no power…….can you say EEKS!?! It’s definitely in my best interest to have snacks to keep them happy! (or keep them on a sugar high) And, if I’m lucky….make the t.v/video game withdraw a little bit easier to handle! Luckily, the lights have yet to flicker….KNOCK ON WOOD!!! – In a large saucepan, bring sugar, cocoa powder, butter, milk and salt to a boil. – Boil rapidly for 2 minutes. – Remove from heat, and stir in oats and peanut butter until completely combined. – Quickly drop large tablespoons of the mix onto wax paper to set. Let cool. * There are quite a few differing opinions about what order to add the peanut butter and oats. I prefer adding the oats first. I think they soften better in the hot chocolate mixture. Then, I add the peanut butter. Some people stir the peanut butter in until mixed and then fold in the oats. Do whatever you prefer. 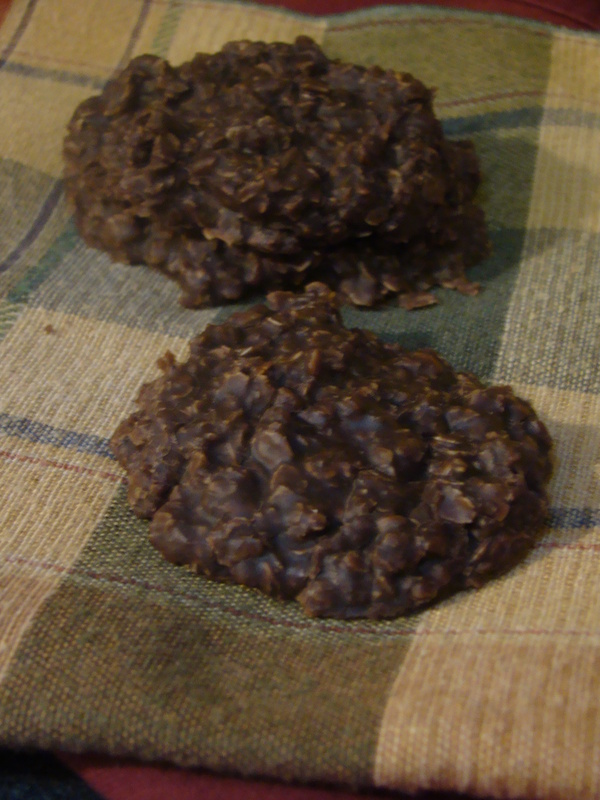 ** These cookies set different almost every time I make them. I think it largely depends on the complete boil time. Make sure the boil rolls for 2 full minutes. Sometimes they come out shinier as well, which I think has to do with the oil content in the peanut butter or the margarine. No worries though….they always taste great!! The rain has started coming down harder,and the wind is blowing like crazy. I hope everyone stays safe, dry, and warm! There’s something to be said for being “stormed” in….you get to spend time just being together. 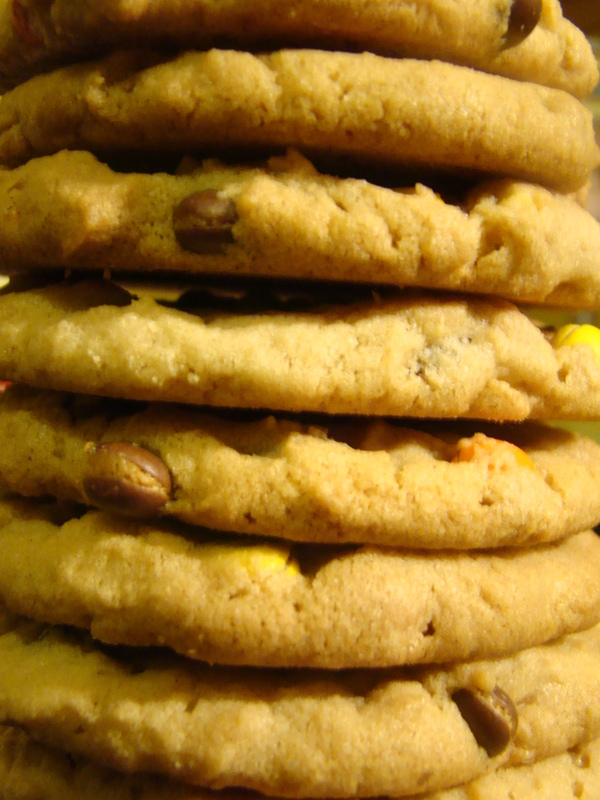 Off to play Connect 4, and have a cookie….or two!! 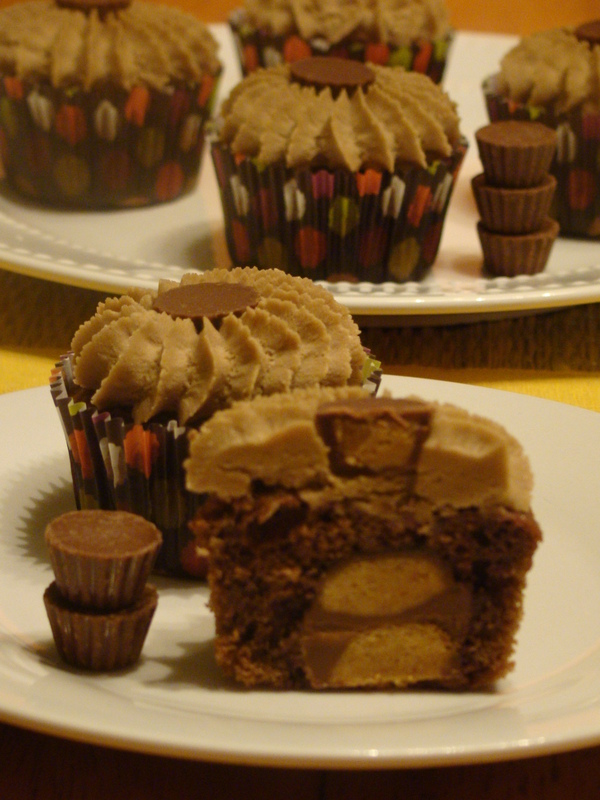 Reese’s Peanut Butter Cup Cupcakes!! It just so happens, these cupcakes were for her middle son’s 5th birthday….along with 2 dozen pumpkin spice, 2 dozen chocolate/vanilla, and 2 dozen sprinkle cupcakes….it wasn’t a big party or anything!!! Ha! We live about an hour and a half apart now, so I was a little anxious about getting all of the cupcakes to the party safely….I mean, one hard brake on the highway and I could have had a tasty buffet on my front windshield! I drove very gently for 10 miles before traffic came to a complete halt….yup SHUT DOWN…..COMPLETELY!!! So, I really shouldn’t have been worried about them looking nice, considering now I had to figure out how to even get them to the party. Traffic ended up being detoured off of an exit ramp and onto a few country backroads….very scenic and calming, which was good; considering I was ready to burst into tears! 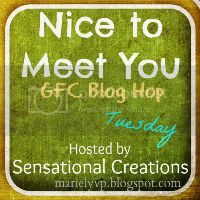 (Ok…that is a total lie….it was scenic, but not calming!) If I thought I could get away with driving past the mile-long-line of cars on the shoulder without infuriating the other drivers, I totally would have! But, I just stayed in line and made my 25 m.p.h. way up the road……atleast I was moving, and THAT is what kept the tears at bay! I was also afraid to run the heat, because I didn’t want the frosting on the cupcakes to get too soft. It was F. R. E. E. Z. I. N. G. !!! The trip ended up being about an hour and a half longer than normal. I got to the party about 5 minutes before it started…..and the cupcakes made it just fine! Baking them was by far the easiest part of the whole adventure!! 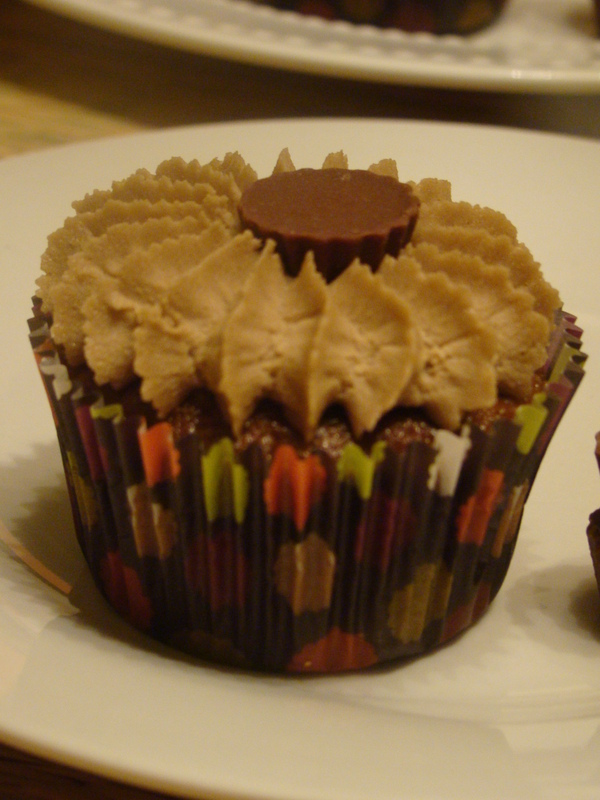 Unwrap and freeze the peanut butter cups first! 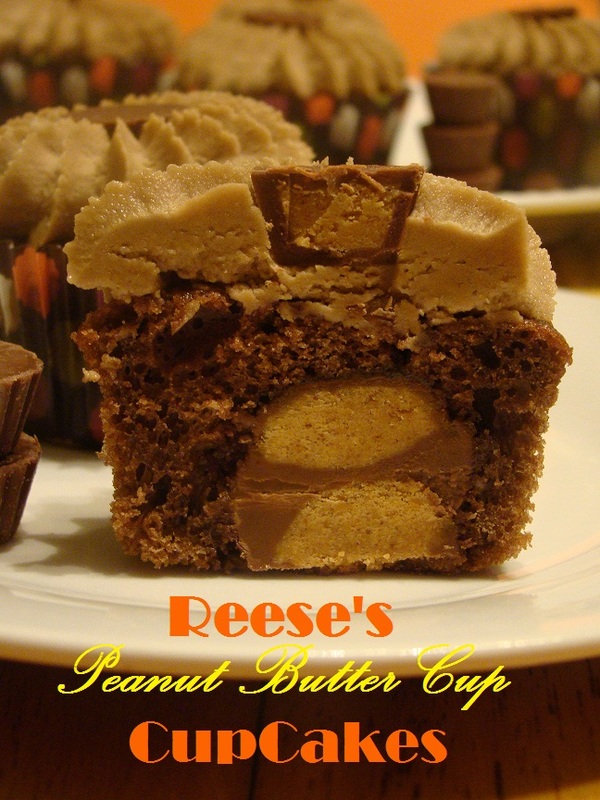 Put about 2 tablespoons of cake batter into a cupcake liner and then stack two Reese’s Cups into the center…. Top them with another tablespoon of batter. – Pre-heat oven to 350 degrees. Place cupcake liners into the muffin/cupcake pans and set aside. – Prepare cake batter according to directions on the box. – Put 2 Tbsp. of batter into each liner. 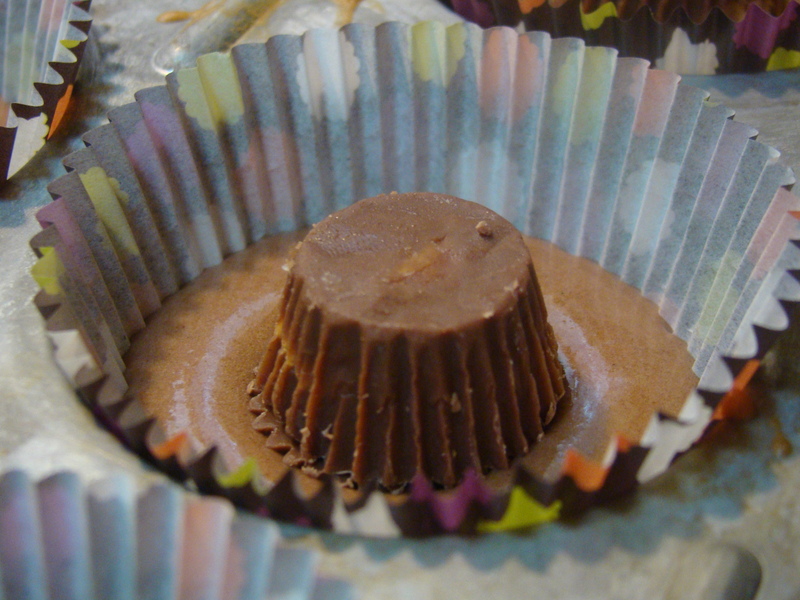 – Stack 2 peanut butter cups into the batter of each liner. 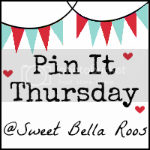 – Put additional 1 Tbsp. 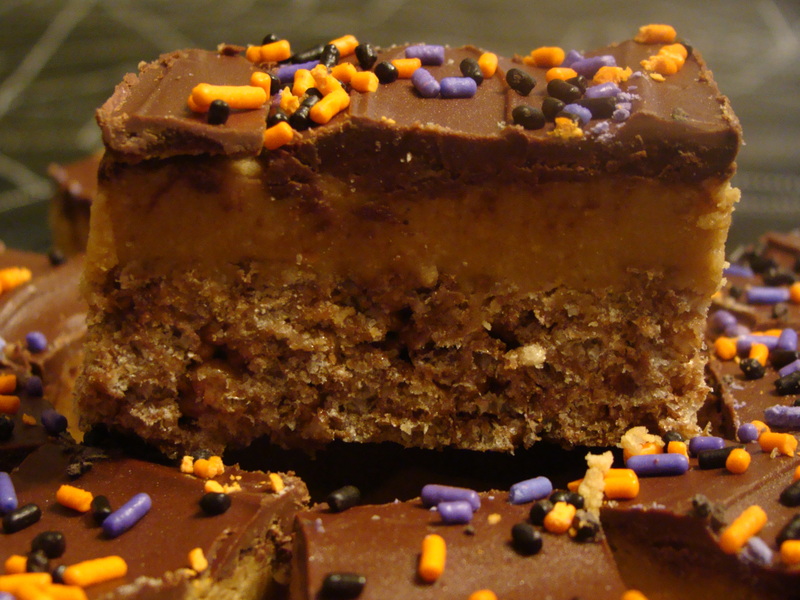 of batter onto the stacked peanut butter cups. – In a large bowl, cream the butter and peanut butter. – On low-speed, add the powdered sugar and cocoa powder. 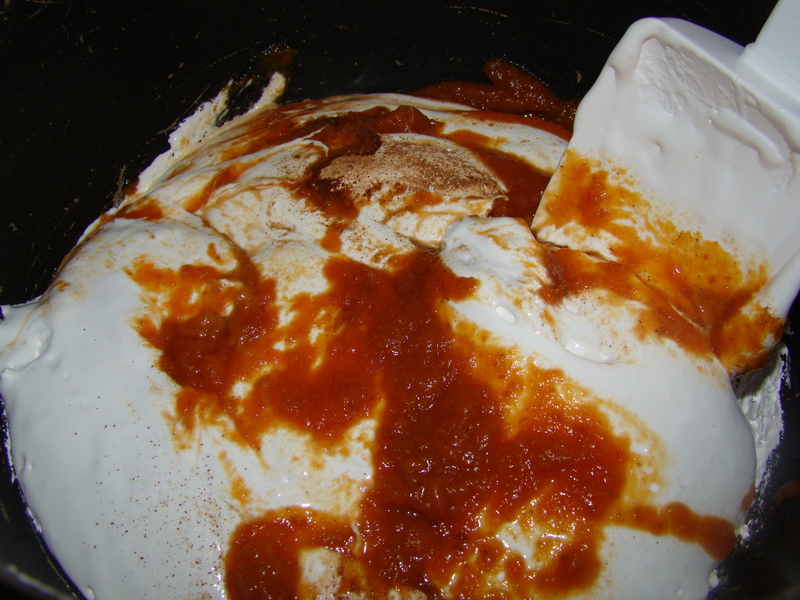 – Mix in marshmallow fluff. – Increase speed as all of the ingredients combine and whip until fluffy. 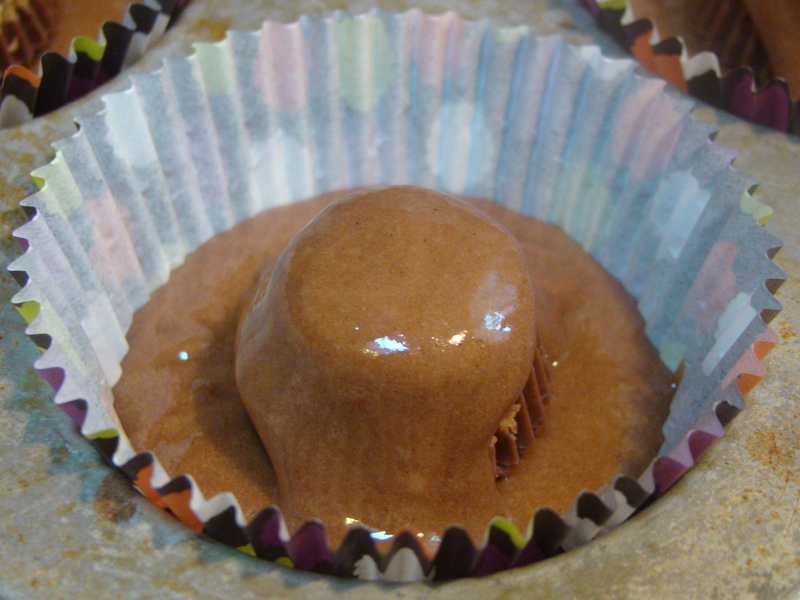 – Spread onto cooled cupcakes, or use a decorating bag and tip. 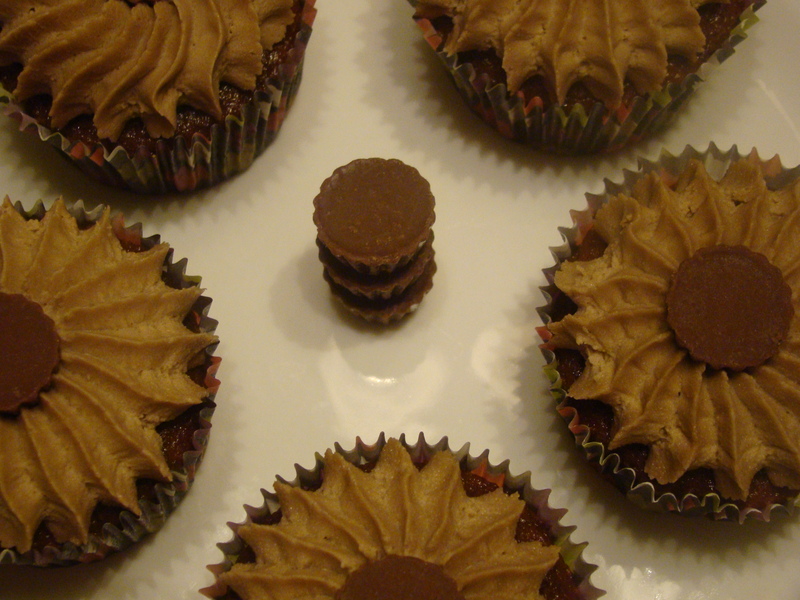 It was pretty cool listening to people trying to figure out how I got the peanut butter cups inside!! Most everyone thought they would melt if I had baked them, so I must have cut the cupcakes and filled them after they were baked! 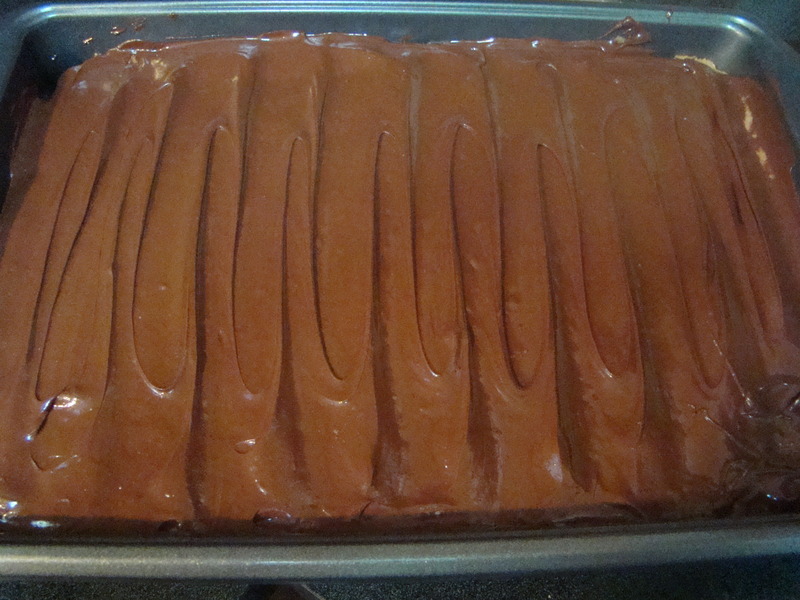 I made Peanut Butter Bars today! 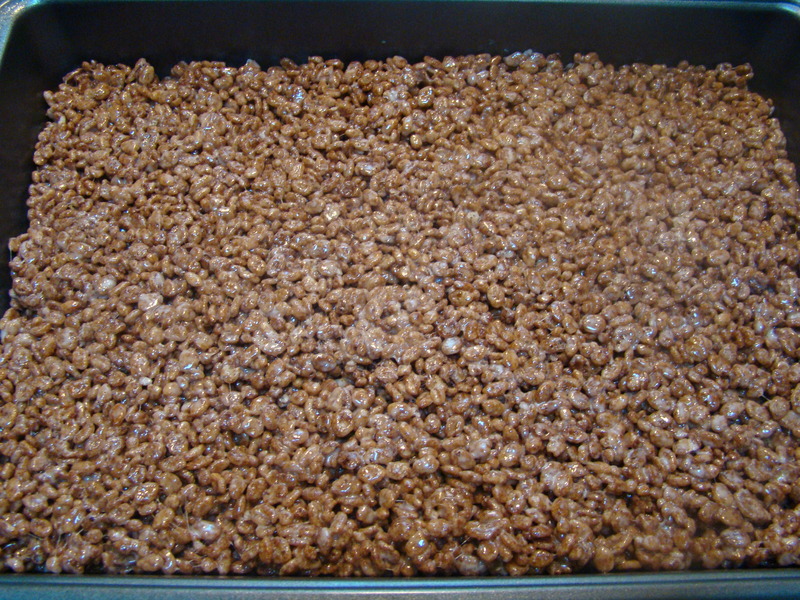 I made the first layer with Cocoa Krispies Cereal…..
Next, I spread on a Reeses-like peanut butter layer……. And for the 3rd layer……Chocolate! I know…..I’m kinda genius!! Aren’t you glad we are friends?? 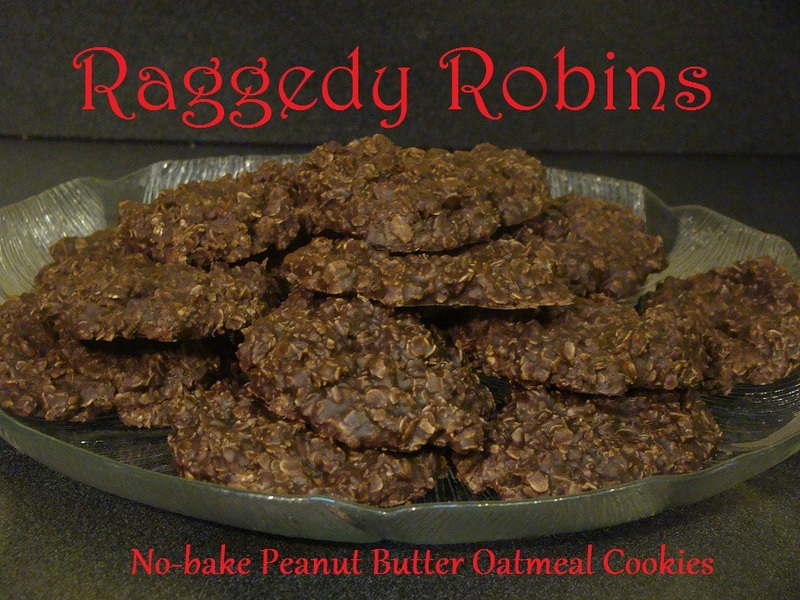 They are a mix of traditional crispy cereal treats and peanut butter bars….both stand well on their own, but together…..W O W!! – Melt butter in a saucepan. Add marshmallows until completely melted. – Remove from heat and stir in cereal. 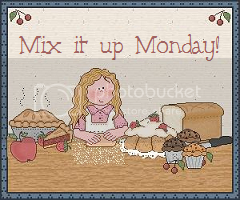 Mix until all of the cereal is coated with marshmallow mixture. 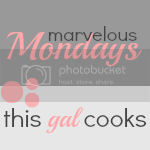 – Press into a sprayed 13 x 9 inch pan. (I used wax paper to flatten. Just tear of a sheet that fits inside of your pan and press evenly….I used the back of a spatula.) Set aside. – In a medium bowl, combine graham cracker crumbs and sugar. Set aside. – In a microwave-safe bowl, melt butter. 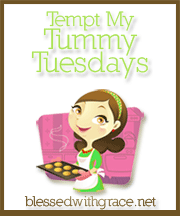 – Mix peanut butter into the melted butter, stir until totally incorporated. 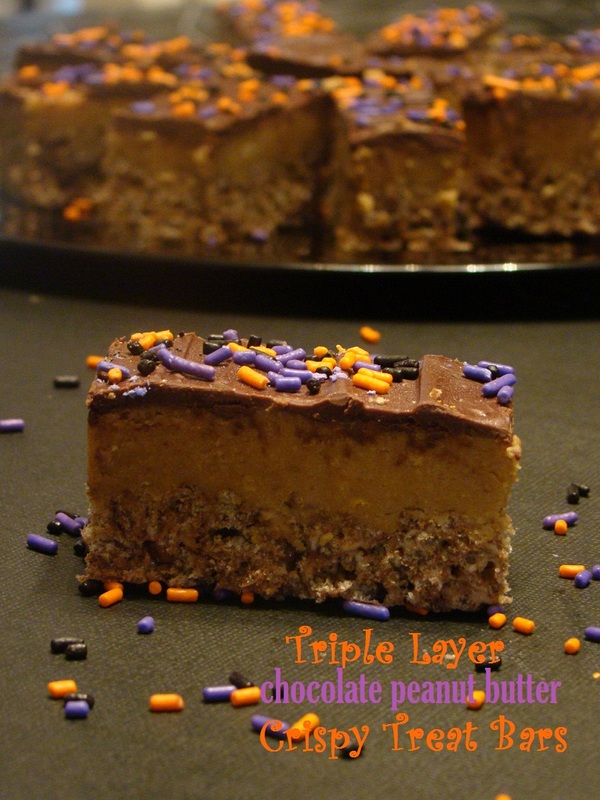 – Pour peanut butter mixture into the dry ingredients and mix well. – In a microwave safe bowl, melt chips and oil for 30 second intervals. Stir between each until completely melted. – Top with your favorite sprinkles. 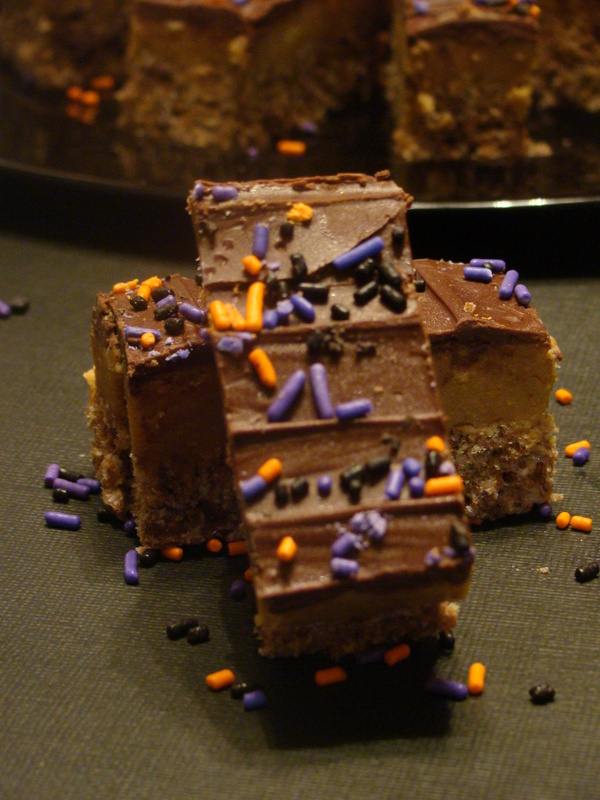 These are the bars I had planned on making for you on Tuesday, but after I had my action-packed adventure in the Wal-mart parking lot; I decided I needed something a little more simple that day. I hope you can forgive me for holding out on you for two days! But honestly….. had I made them that day, I probably would have turned into an emotional eater and downed the entire pan before my children got home. When they asked me where their snack was….I would’ve had to tell them I ate it all and they would have to eat an apple or something. And well……that would seem greedy and not very motherly….i’d probably feel super bad and start to cry. So I waited….for my children’s benefit…..you understand! 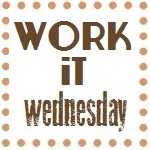 Now that you have them….I hope you enjoy! 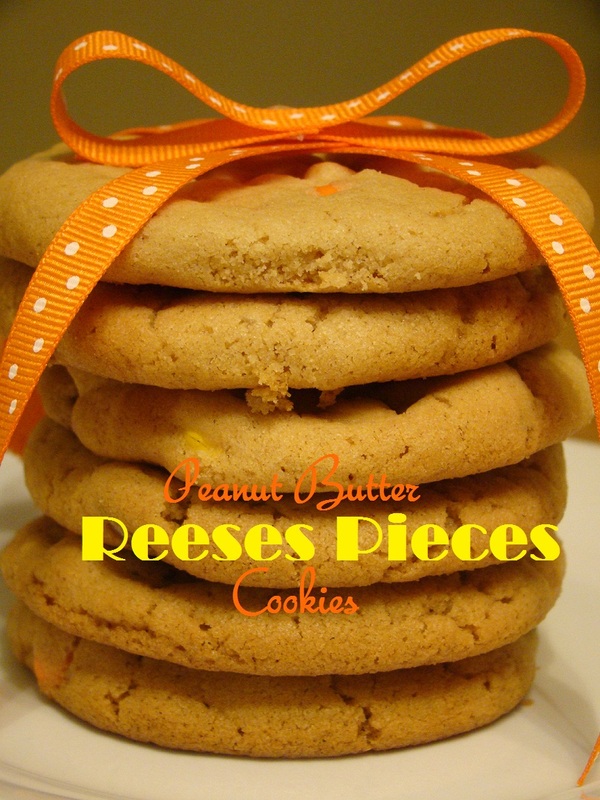 Peanut Butter Reeses Pieces Cookies!! Everyday last week, my daughter came home from school and said, “Did you make peanut butter cookies?” And everyday the answer was the same…..”Nope, not today”. I didn’t even know she loved peanut butter cookies….hmmmmm! So what was a mama to do?? 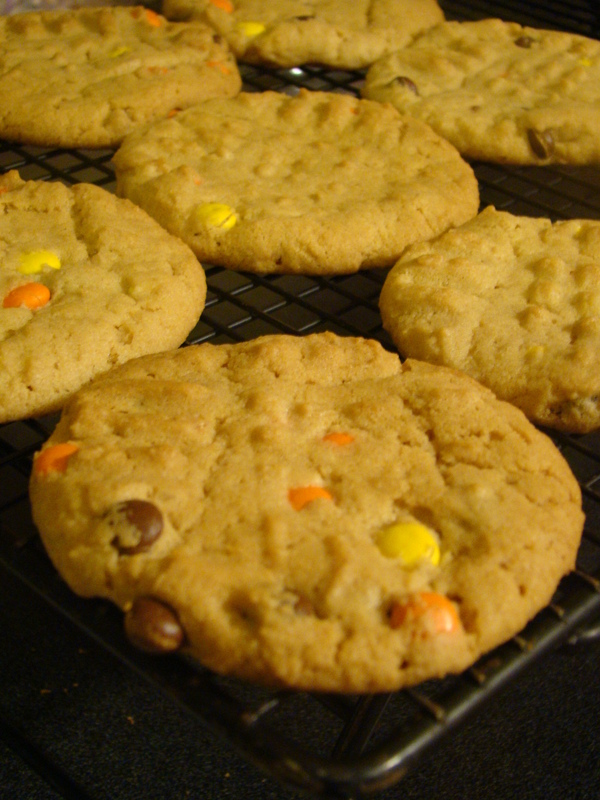 Make peanut butter cookies, of course!! And, since I made her wait; I figured I would throw in a bunch of her favorite candy. Reeses Pieces tops her list…that much I do know!! Whew…..because you never know what might cause a foot stomp or a slammed door when it comes to a pre-teenager! I do know that I had this crazy eye disorder which caused them to roll incessantly! Usually accompanied by a huge dramatic sigh. EEks! Sorry Mom! So these cookies are kinda for you too 🙂 ! 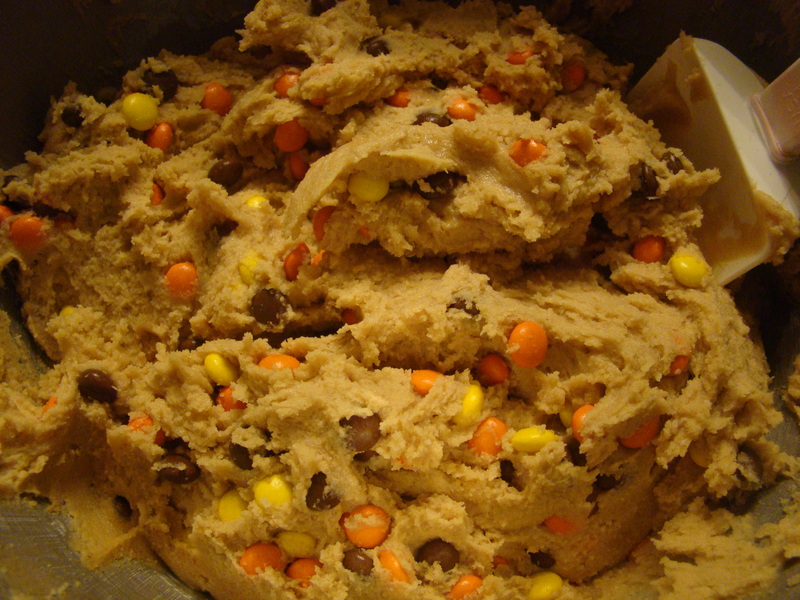 – In a medium bowl, cream butter, peanut butter and sugars until smooth. – Add eggs and mix. 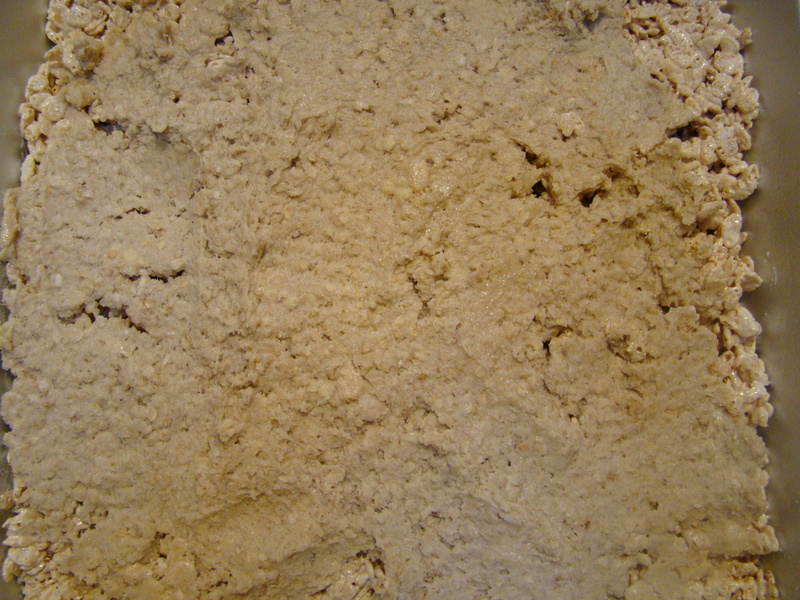 – In a separate bowl, sift together flour, salt, baking soda and baking powder. – Slowly mix into the wet ingredients. 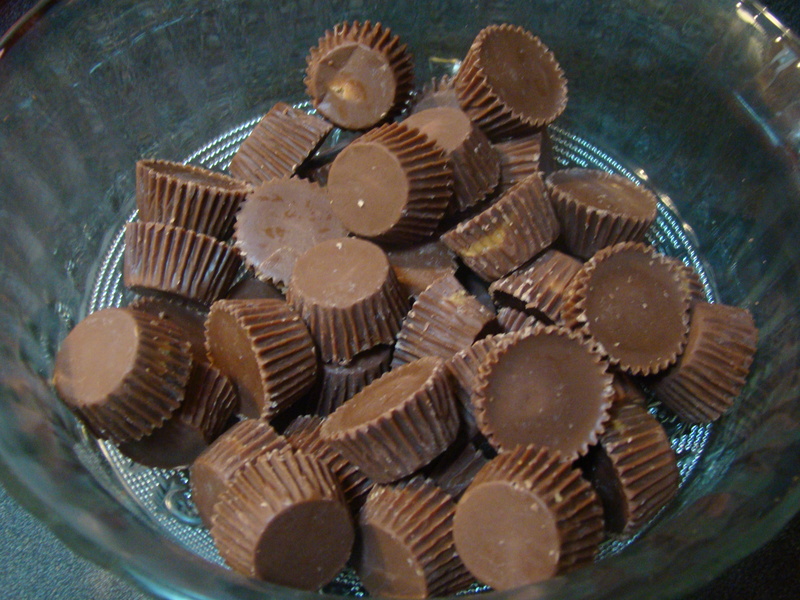 – Fold in Reeses Pieces. – Refrigerate dough for an hour. – Bake 12-14 minutes or edges are golden and middle is set. Cool slightly before transferring to a wire rack to cool completely. The cookie jar is full again! 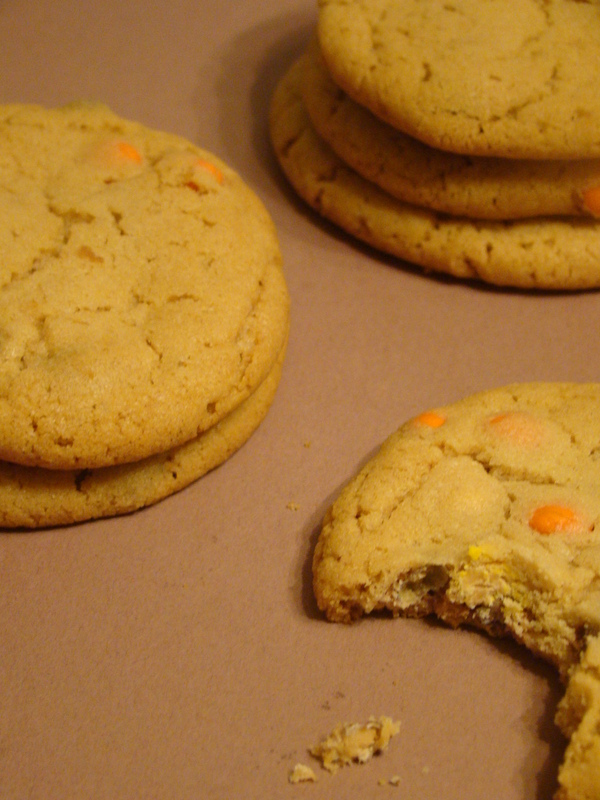 So, if you have a cranky daughter; you should definitely make these. They have like some magical good mood stuff going on in them, and they totally work on boys too. Heck, you could probably just “accidentally” leave the Reeses Pieces on the counter for the boys and they’d high-five you! For those of you that don’t know what fluffernutter is……. A Fluffernutter is a sandwich made with peanut butter and marshmallow cream, usually served on white bread. 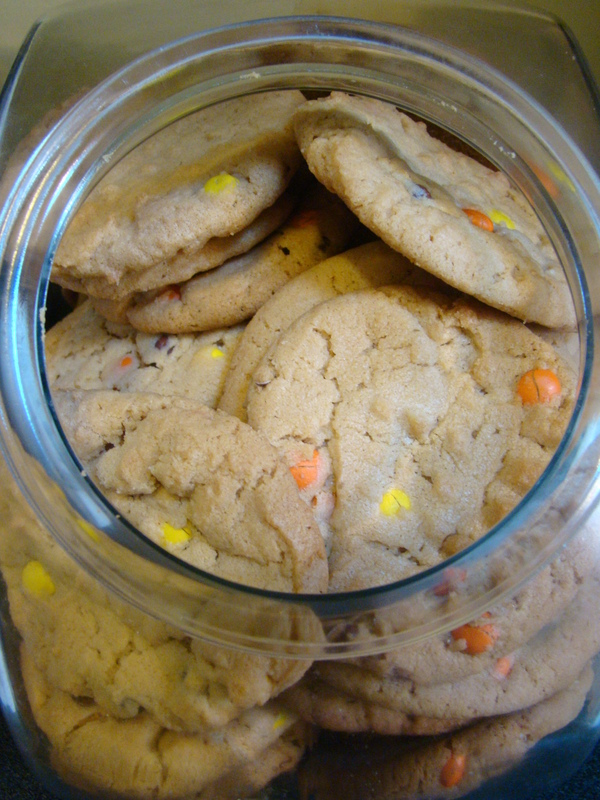 The term fluffernutter has also been used to describe other foods that feature peanut butter and marshmallow cream, including Fluffernutter cookies, bars and cupcakes. If you are curious, feel free to read about the history of fluffernutter here. 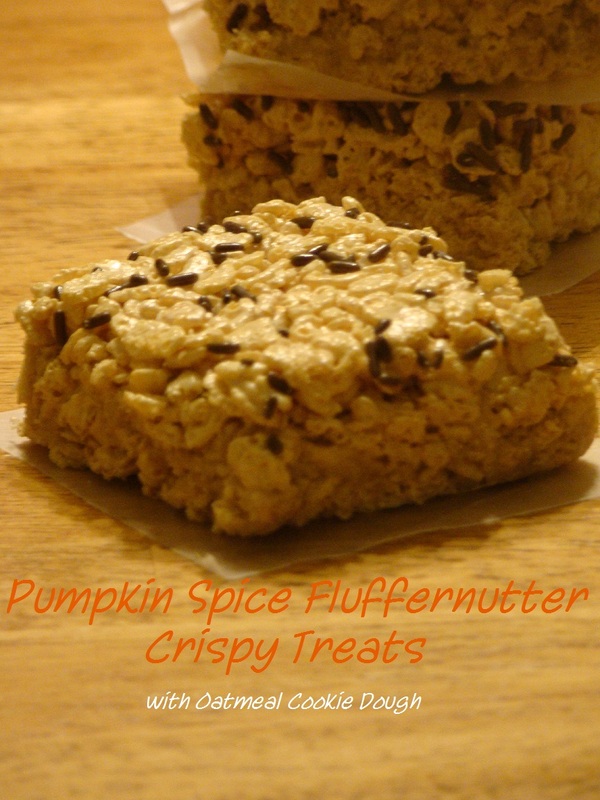 I have been planning on making pumpkin spice crispy treats for you, and what better day than today?? I mixed the marshmallow cream, pumpkin, pumpkin spice, and peanut butter together and melted it until smooth in a saucepan. It doesn’t look too appetizing yet, but just wait!! Next, I mixed in the crispy rice cereal….. Finally, I layered the rest of the cereal mix on top and sprinkled it with chocolate jimmies! 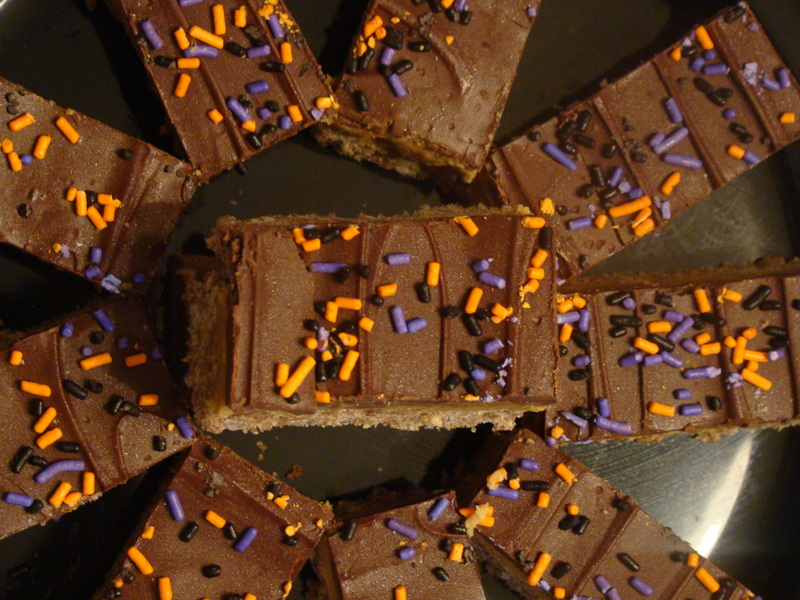 There’s a lot going on in these bars…..but they are very good! – In a saucepan combine fluff, pumpkin, pumpkin pie spice and peanut butter. – Heat thoroughly until completely combined. Cool. 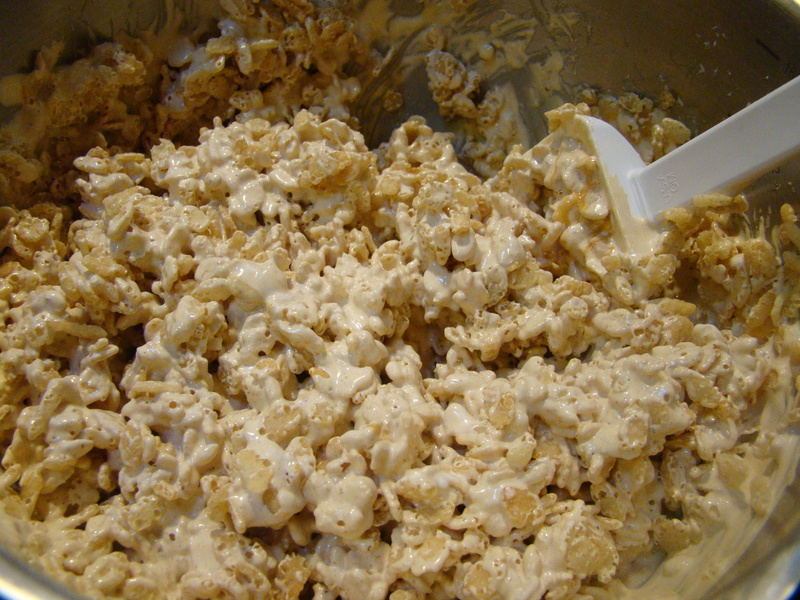 – In a separate bowl pour the marshmallow mixture over cereal and mix until coated. – Mix in milk . 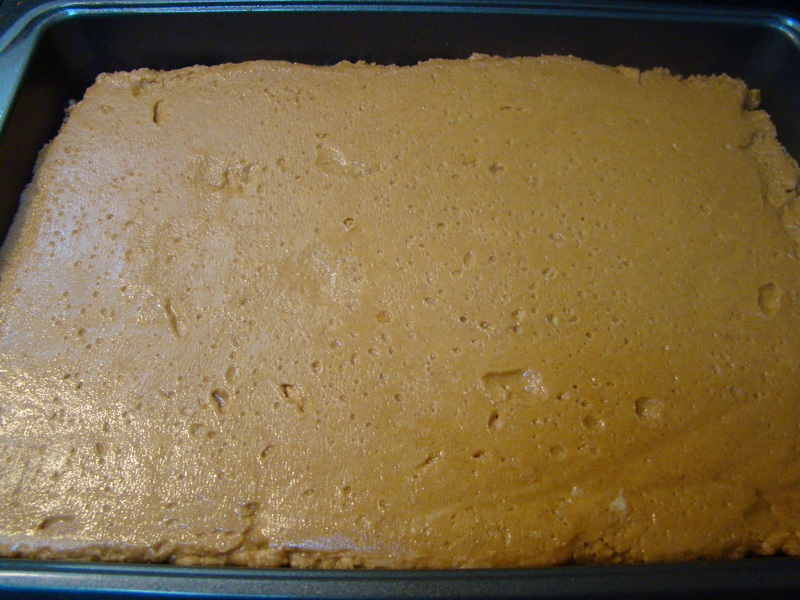 – Stir in flour, oats, salt and pumpkin pie spice by hand until combined. 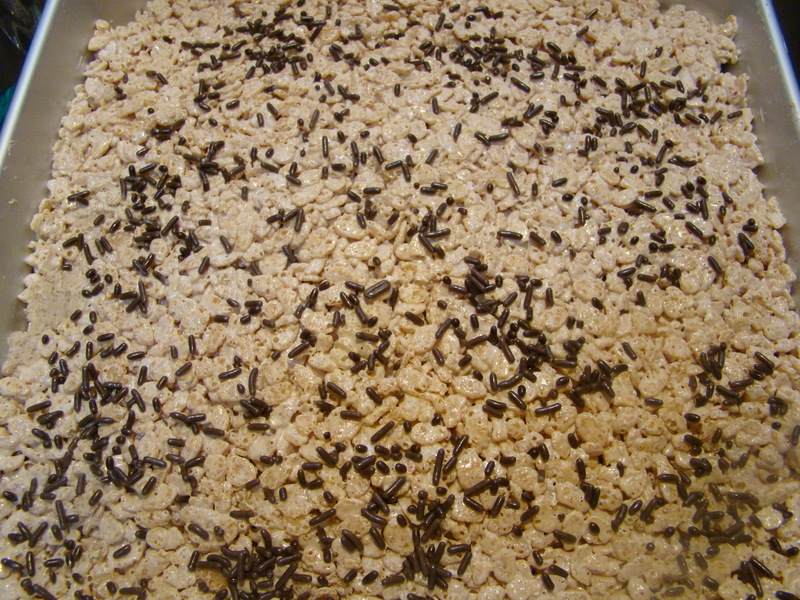 – Top with remaining cereal mix and jimmies. 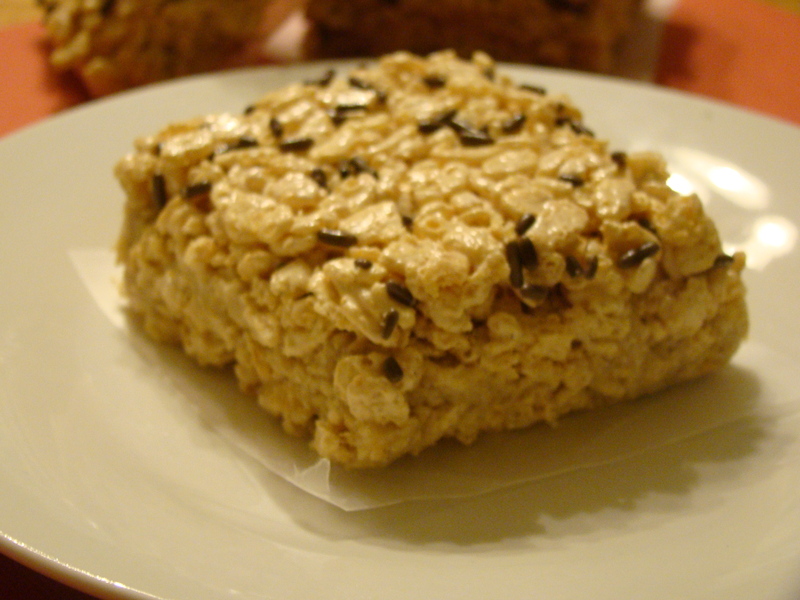 – Refrigerate until firm, then cut into squares. *EDIT: Because of the oil in the peanut butter and the moisture in the pumpkin these start to soften after a day. The texture gets slightly chewy. 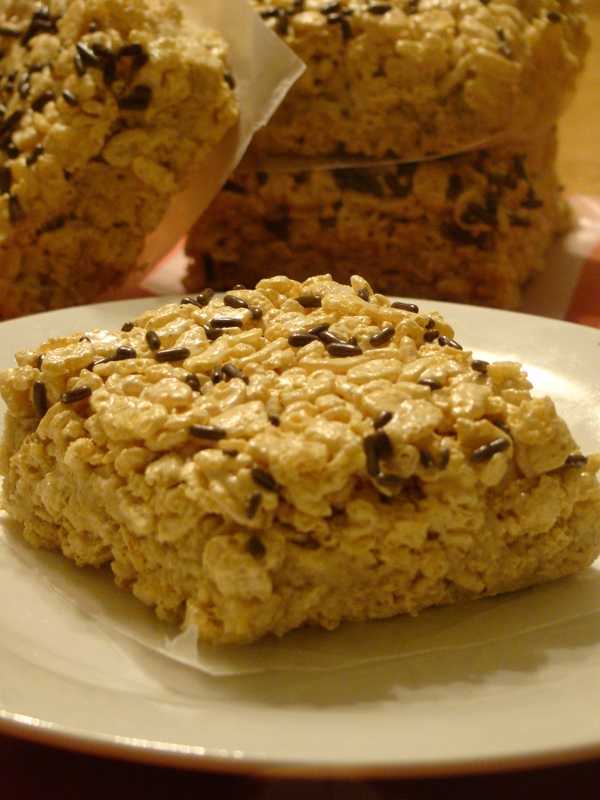 These are a bit softer than the traditional Rice Crispy treats. I’m sure that using marshmallows would firm them up a little bit if you would like a crispier consistency.